New Oil Zones in Canada Still Being Discovered–And They Pay Back FAST! Napoleon is credited with the saying—I would rather have my generals be lucky than good. 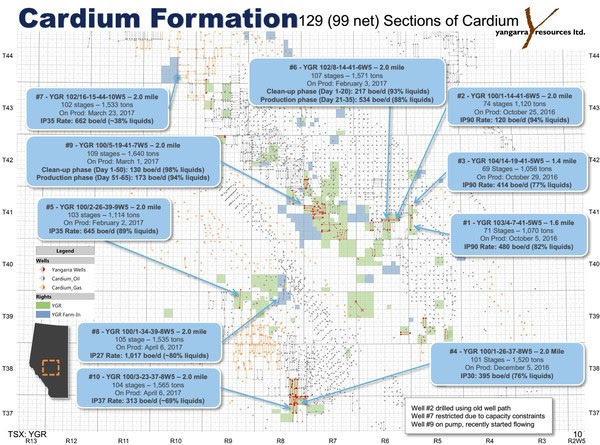 And that’s a good saying for Yangarra Resources (YGR-TSX), as they discovered how prolific the Lower Cardium, or “Bioturbated Zone” is in Alberta’s massive Cardium formation–all by accident. They were drilling in the main Cardium zone above–which everyone agrees is more porous and therefore better rock–but their directional drill went too deep one time. 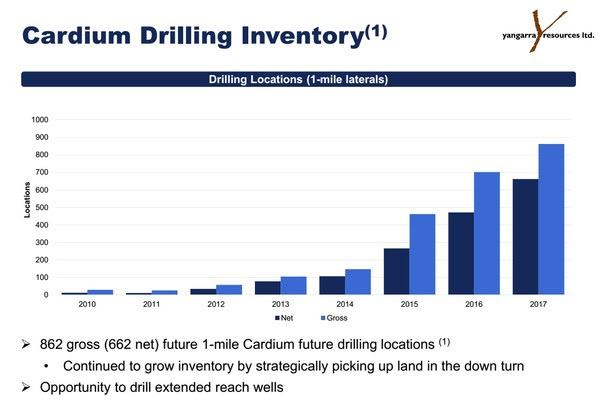 Despite their best efforts, they could not get the drill back up into the main Cardium payzone they wanted. So they fracked it anyway and WHOOSH! Up from the ground came a bubbling pool, as the TV song goes. With higher pressures, better flow rates, and lower declines–Yangarra created a big improvement in the rate of return being earned from previous Cardium wells. At US$47.50/bbl WTI pricing, Yangarra’s type curve generates a half cycle internal rate of return of 132% and suggests the wells have a payout of 10 months. That would make those wells every bit as good as the very best parts of the Permian Basin where land prices have hit $50,000 per acre. 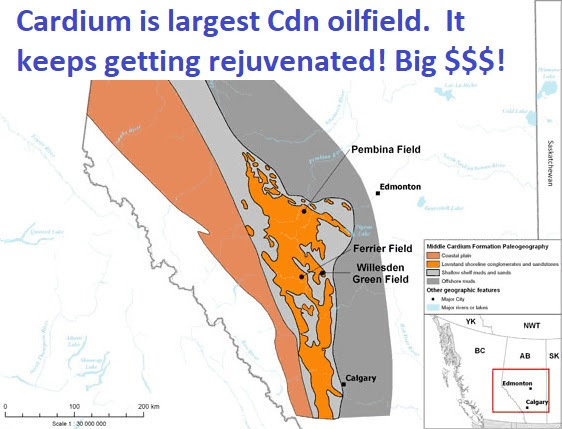 Well, that well has (once again) rejuvenated the huge Cardium formation–the largest bearing oil formation in Canada, with over 10 billion barrels of Original Oil In Place (OOIP) and it has produced over 1.6 billion barrels in its history. Yangarra’s success–the stock has gone from 4o cents to $3.75 in 18 months–has spurred many different junior producers to drill their horizontal legs a little deeper in the Cardium, and has (the few remaining) energy investors searching for who else could drill this slightly deeper formation. The reason that Willesden Green and Ferrier Cardium operators had not intentionally targeted the Bioturbated Zone previously is that it is a siltstone that wasn’t thought to be favorable for fracking. What Yangarra discovered is that the Bioturbated Zone–is extremely brittle (or at least that is the theory) and with enough pressure will crack. Since that first surprisingly successful well Yangarra has been continuing to experiment with the best way to attack the Bioturbated. The first few Bioturbated wells had roughly 70 frack stages and 1,000 tons of sand. The most recent wells drilled this August are two mile laterals with over 130 frack stages and 3,000 tons of sand. The company has yet to hit the optimal well design and until the well results stop getting better you can expect them to keep pushing forward with more frack stages and more sand. Yangarra had been operating in the Cardium for seven years and hadn’t tried drilling a well into the Bioturbated. The company only gave the formation a shot by accident. The timing of that accident couldn’t have been any better given that Yangarra had been quietly accumulating additional Cardium land on the cheap during the low oil price environment of 2015 and the first half of 2016. In total the company added over 30 sections of contiguous Cardium land in the Willesden Green – Ferrier area. All of that acquired land has to have increased dramatically in value with the rates of return that the Bioturbated is generating. Good news travels fast in this industry and Yangarra is not the only operator with Cardium land prospective for the Bioturbated Zone. “InPlay has continued using new completion technologies as well as reduced spacing between fracture completions in the horizontal leg on several wells drilled to date. The recent wells in Willesden Green have been drilled targeting the lower bioturbated portion of the reservoir with the only exception being West Pembina which targets thick tight halo sands. Arc Resources (ARX:TSX) and Bellatrix Exploration (BXE:TSX) have disclosed drilling Bioturbated wells but haven’t said much beyond that. Tamarack Valley (TVE:TSX) has noted a significant uptick in its Cardium well economics but didn’t specifically name the Bioturbated. Another group with a large Cardium land positions is Bonterra Energy (BNE-TSX), and I had the lucky fortune of sitting down for lunch with legendary oilman George Fink, Chairman and CEO and COO Adrian Neumann the other day. Now before I give you their comments on the Bioturbated, I want to tell you BNE is unique in the Canadian oilpatch as Fink has run his public company like it was his own; hardly ever raising extra equity or debt (there’s still only 33 million shares out and no rollbacks!). The stock has gone from pennies to $60 at the top of the market and paid out hundreds of millions in dividends. BNE has a large, contiguous (all-together) land package in the Cardium just north of this Willesden Green. I asked them what their plans were for attacking the Bioturbated, and Neumann just smiled. He had clearly been asked this question a lot, ever since Yangarra’s stock started to take off and everybody came looking. He patiently explained to me that they have been fracking down into what they call “The Lower C”, for lower cardium, for years. What everyone now calls the Bioturbated is really just the same formation that gets tighter and tighter sands as you go down…but only about 15 metres down. It’s not really a different formation. But because everyone has been drilling into the higher quality (looser; more porous) rock 15 metres above, and just fracking a little bit down into “The Lower C”, the industry didn’t appreciate how productive it could be if you just put your horizontal leg right down in the middle of it and fracked UP into the looser, more porous main Cardium zone. He did say that while some of their drilling had shown a big increase in IP rates doing this, they had a big enough land position–already held by production so no land expiry issues–that they would let Yangarra et al drill for a couple more years here, find “Best Practices”, and importantly–see what the declines are after 1-2 years–then they would consider drilling into The Bioturbated, or Lower C, on a more regular/consistent basis. While the impact of the Bioturbated is most obvious in Yangarra so far it will undoubtedly begin to make more noise elsewhere in the months to come. If Yangarra’s stated economics are accurate…….. it has to. Yet here we are almost 7 full years into it and an entirely new approach (found by accident) has taken economics here to a level we wouldn’t have thought possible a few years ago. It makes a person wonder how much better all of the horizontal plays can still become in the coming years as the pace of this industry’s technological and technique improvements show no sign of slowing. Next post: What Is The Most Important Factor For 2018 Oil Price?